About the Author: Kara Brook is an artist with a lifelong fascination for beeswax who paints and sculpts with it. 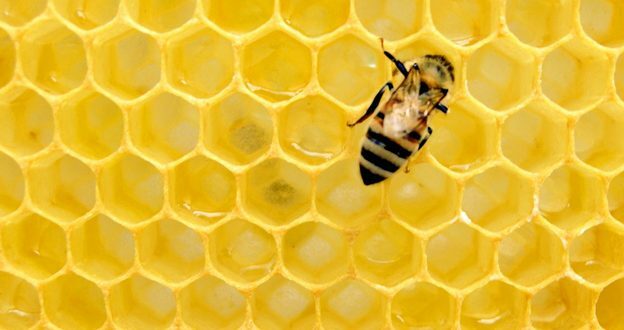 In 2010, she started beekeeping to produce her own encaustic medium and has developed a passion for the battle against the dangerous decline of the bee population and the precious healing properties of honey. Follow @waxingkara on Twitter to see what she shares next. Sweet, sustainable, and loved around the world, honey is a multi-purpose wonder. It does wonders for our health in a variety of ways, provides soothing solutions for our hair and skin, adds just the right flavor and texture to our cooking, and satisfies our cravings in healthy ways. You may have grown up loving honey just for its most basic qualities – enjoying in on your toast, drizzling it into your hot tea, or perhaps slipping it onto a peanut butter sandwich. The versatility of the amber liquid you’ve admired in the bear-shaped dispenser deserves more than just a few lines – let’s catch up with how honey has the potential to be a part of your and your family’s life from morning to night. Honey was mentioned in the Bible as a promise to the Israelites: “Go up to the land flowing with milk and honey.” (Exodus 33:3); was used ancient Greek athletes in the Olympics for energy, and was fermented for mead in several cultures prior to 7000 BC. Our ancestors were on to something: honey is a powerhouse of carbohydrates and energy – all with a low glycemic index. Many enjoy the benefits of plain raw honey on a regular basis, eating a spoonful at a time to enjoy a healthy energy boost, get a dose of antioxidants, and enjoy other nutritional advantages. Since the taste of honey will vary with the type of flowers the bees have visited, there is an active market in different types of honey. Much like wines, every crop of honey can have different flavors that are influenced by the time of the year and the potency of the flowers. From dark and strong to lighter and smoother, there is a type of honey for every palate: The National Honey Board reports that there are more than 300 varieties in the U.S. alone. Blended into doughs, drizzled onto dishes, and used to balance out the sharp tastes of other ingredients, honey has uses that continue to evolve. Home cooks and chefs consider it a staple in their pantries. It can be substituted for sugar in baking, used to sweeten blended drinks and yogurts, and of course makes incredible salad dressings and marinades. Honey has been used for centuries to coat and bake meats to tender perfection – it’s not just ham that can be used in this treatment. The qualities of honey have even made it into the alcoholic beverage industries. In distilled spirits, the sweetness of honey is burned away in the fermentation process, leaving more of the essence of the honey behind in a floral taste. It’s a fairly new field, but vodka, schnapps, and other “honey spirits” are available in the market now. Now, as in ancient times, mead is still made from honey, water, and yeast. If you get a hankering to it for yourself, it’s a fairly simple process that can be tried at home. Honey has a very long shelf life, can be easily de-crystallized by placing the jar in warm water, and can even be frozen, if needed. One might make an argument that a good supply of honey might provide more benefits than sugar, if one had to make a choice for what to take to a desert island. Speaking of desert islands- honey could make a great addition to the medicine cabinet. Here are just a few of its suggested uses. Antibacterial and anti-inflammatory, honey has been used successfully for thousands of years to treat wounds and minor burns. Studies today continue to show that using honey for traditionally difficult to treat wounds such as those suffered by diabetics can be a valuable addition to healing therapies. If you’d like to try it at home on a minor scrape, just dab it on as you would an antibiotic ointment. The same properties that help heal wounds can also soothe and heal a variety of skin problems, such as psoriasis, acne, rosacea, eczema and insect bites. It’s also been shown to help with stubborn cases of diaper rash, when added into diaper cream. There are many home recipes for treating skin conditions – a simple way to see if it might work for you would be to mix some honey into coconut or sweet almond oil, applying it for a short time, and then rinsing with warm water. Honey is a time-honored remedy for relieving coughs. One study found it performed better than the ingredients found in many over-the-counter remedies when used on children at bedtime. It’s gentle, does not have the possible side effects of some cough medicines, and certainly provides a more pleasant experience for kids. It’s easy enough to try at home- try using a tasty lollipop to make the whole process a treat. The effects of taking NSAID painkillers, aspirin, and drinking alcohol can cause stomach irritation and gastric lesions. Honey can help coat and protect sensitive stomach tissues. If you feel that you may be causing irritation with every dose of ibuprofen, consider taking a spoonful of honey along with your pills. The protective qualities can also help relieve the burning that accompanies acid reflux. Elsewhere in your digestive system, there’s the possibility that eating raw honey can help balance out your intestinal flora by nourishing the beneficial bacteria and starving out the bad varieties. Honey can also help soothe gastrointestinal tract conditions such as diarrhea. Some evidence has been presented that honey can help reduce tooth plaque – working as well as mouthwashes designed to do the same. The antibacterial properties have been cited as a reason for the surprising claims. A blend of honey, olive oil, and beeswax has been recommended for easing the itching, burning, and bleeding of painful hemorrhoids. Not only does it provide soothing relief, it can also help with healing fissures and skin damage. Even yeast infections can be helped by using raw honey – it’s also an antifungal agent. When applied internally with yogurt, some people report finding relief. Eating a couple of teaspoons of honey daily can also help with balancing your probiotic levels, which can be related to infections. Honey is also a versatile helper in another area of the home medicine cabinet: keeping skin and hair looking and feeling great. If you haven’t stocked up on your raw honey supply yet, check out some of the ways it can be used for all sorts of beauty treatments. If you want a sweet-smelling hair mask, honey works well with olive oil for a deep-conditioning treatment. Heat up the mixture with two parts honey to one part olive oil, apply the warm mask to your hair, and wrap it up with a towel. Let it soak in, and rinse out. Don’t worry, the same honey that makes your hair glossy won’t remove it during your conditioning treatment – but it can make for a time-honored hair removal method when used with lemon juice. The technique has been used for centuries in the Middle East, including today. Honey is a big player in facial masks and can be used in many recipes. It also works just fine on its own for hydrating and treating skin. You can experiment at home with olive oil, almond oil, coconut oil and additional ingredients like egg yolk green tea, and lemon to find mixtures that will help clear, soothe, and moisturize your skin. Check out the internet for recipes. Honey can help you scrub away flaky skin and also soak it into softness. For a decadent bath inspired by Cleopatra, add 2 cups of milk and a half cup of honey to your hot tub. For scrubbing and soothing power, mix honey with baking soda or almond hulls to create a paste that will help swirl away dry skin. For a home manicure treatment that works, cover your nails in equal parts of honey, apple cider vinegar, and olive oil. The enzymes in the honey will work gently on your cuticles while the other ingredients help the skin heal. Some say it increases nail growth – treating your cuticles to a nice massage while you work the mixture in probably helps, too. Honey is incredibly useful around the home – or away. With all its versatility, it makes for a great item to keep stocked in your RV, camping cabin, or cooking gear. Be sure to always have some around and you’ll be prepared for more everyday situations than you ever dreamed of!